A novel approach to analogue modelling, and great for dipping your toe into the 'cult of modular'. A year ago Roland introduced the world to its highly anticipated Airas, a range of all-digital sound generators and processors that doffed their hats to some Roland analogue classics. Some chastised Roland for taking the digital emulation route and not following Korg down the analogue path that started with the Monotribe and led to the full-scale resurrection of the MS-20. Those 'binaryphobes' can sleep easy as Roland has announced the System 500 analogue modular system. However, Roland has also expanded the System-1 range with the System-1m. At its core, this is a keyboardless rack-mountable version of the earlier synth. However, there's no disguising the array of patch points that fill the top of the synth. Given that this is a digital synth, their inclusion is both very unusual and highly alluring. But does it live up to the promise of a potential inter-synth patch frenzy? Lifting the 1m out of its box, you are greeted with a relatively small 3u black plastic box with a metal fascia. It feels robust, but not indestructible, and can be used as a desktop synth, mounted in a 19-inch rack (using the included rack ears) or a large Eurorack module. Most of the controls are knobs, with only the envelopes utilising faders. 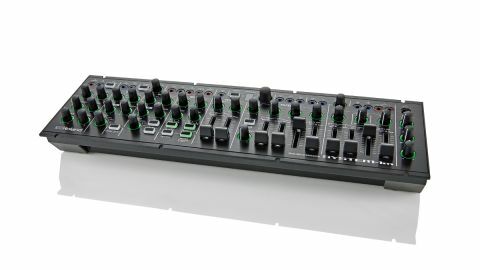 All knobs, buttons and patch points follow the Aira colour-styling and are backlit in some way - with lots of green! Power is supplied via the included DC adaptor or (rather smartly) from a Eurorack power connector - the appropriate cable comes with the synth. While most in/out ports are on the front panel (including USB), MIDI in/out sockets are on the rear next to the main audio outs on unbalanced 1/4-inch jacks. For those wishing to rack the unit, a second set of MIDI ports (selectable in the unit settings) are on the back of the unit. Racking may also require you to use right-angled jacks or to switch to using the mini-jack audio outs on the front panel. As purchased, the System-1m comes with its own 'synth model', though there are some interesting options for expanding its palette that we'll explore later. In terms of overall synth architecture the 1m takes the relatively conventional dual-oscillator, subtractive analogue-style synthesis route with a few interesting extras thrown in. Let's start with the all-important oscillators. There are two main oscillators, with an additional sub-oscillator and noise source. Each oscillator has three classic wave shapes - sawtooth, square and triangle - and a Color control for tweaking each further. "The new synth models available via the Plug-Out system really extend the System-1m's sonic scope." The manual helpfully states that the Color knob "result depends on the waveform" - and that's it. Delving deeper, and with the help of my DAW's waveform view, the sawtooth wave's symmetry appears to change as the control is moved. In sonic terms you get a subtle phasing quality as the knob is turned. With the square wave selected, Color adjusts the pulsewidth, while the triangle wave gets progressively richer (with more harmonics). The oscillators do have an analogue feel about them (if that's what you want), with subtle drifting in evidence when playing together. Where they depart from standard analogue fare is in the second set of waveforms, which are effectively doubled versions of the first - with the Color knob now controlling the amount of detune. This makes it possible to create some very thick textures that include, but are not limited to, the 'supersaw' delights of crossover EDM. A very recent OSupdate expands the oscillators' choices with six new waves (Noise Saw, Logic Operation, FM, FM + Sync, Vowel and Cowbell) that really open up the sonic territory the synth can cover. The Color setting can also be modulated by the LFO and three envelopes or even the sub-oscillator (which adds a little more grit in most cases). Cross Mod, a form of inter- oscillator Frequency Modulation that has graced a number of classic Roland synths, is implemented here, though it is arguably a little more polite than that found on my Jupiter-6. Ring Modulation and Oscillator Sync are also possible. Usefully, engaging Sync switches the Pitch Envelope to control only the second oscillator, allowing you to create classic sync-sweeps with ease. Oscillator 2 has a Fine Tune control, though for coarse semitone changes you need to dive into the world of unlabelled, simultaneous key presses and knob turns - all the more frustrating as there is no easy way to do this and play notes at the same time. This is perhaps one area where having a more fully-featured screen makes sense, or maybe just having all functions available via dedicated controls. The native System-1m sound engine offers 4-note polyphony, so you can double things once again by engaging the Unison mode. Be aware though that this is not possible if you intend to use the patch cables or other loadable synth models. The System-1m filter - another defining element in a synth's character - takes the well-worn Roland approach of combining a low-pass filter (12 and 24dB/octave) with a fixed-slope, variable cutoff high-pass filter. The LPF's cutoff is hardwired to the four-stage filter envelope, while the HPF cutoff is set only by its control knob, making band-pass sweeps impossible. The LPF itself has a noticeably analogue feel, but is more generic in sound than some of the best known analogue circuit types out there - though this is not meant as a criticism. It's easy to forget that many synths now hailed as classics were seen as severely limited, or even a bit rubbish, on their release - TB-303 anyone? The Amp Envelope is another straightforward four-stage affair. It's also nice to have a dedicated (two-stage) Pitch Envelope section. The Amp section is home to a few other tonal-shaping a elements - Tone (a simple tilting EQ) and Crusher, which as an effect is perhaps more useful on drums. Other effects include a limited, if decent-sounding, reverb and delay. It would have been great to have a way of modulating delay time from the LFO or elsewhere. Incidentally, there is only one LFO available on the System-1m, though this is mitigated by the included patching possibilities. Sadly, there is no way of modulating the LFO Rate even from an external source. It's a real shame Roland didn't include a Juno-style chorus here - I would have chosen this over the reverb in a shot. The Scatter effect found on the System-1 keyboard has been dropped, along with the arpeggiator - neither a particular loss. The big selling point on the 1m is of course the patching capability, and this works very well, albeit with the limitation that sound-generation in this mode is monophonic. The new synth models available via the Plug-Out system really extend its sonic scope, though with some compromises on the control assignment front. It's also nice to be able to access the synths in plug-in form, however their GUIs have legibility issues which could do with some attention. This is a good-sounding synth with plenty of flexibility, though it does beg the question of to whom it is really aimed. There are now many cost- effective ways to access 'real' analogue synthesis and there is still a stigma attached to digital modelling even if there are many occasions where it is overstated. Ultimately, we commend Roland for taking a new approach to the analogue vs digital debate.